Puto Lanson made with cassava, coconut, and brown sugar is perfect for a snack or dessert. 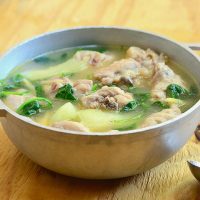 This Filipino delicacy is easy to make, tasty, and gluten-free! I’ve been mostly reshooting and updating old recipes these past months, so I am excited to have a brand new one for you today finally. 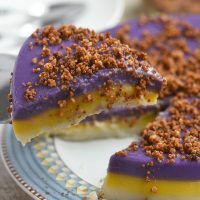 This puto lanson is one of the two puto recipes I worked on over the weekend but unfortunately, the ube puto didn’t turn out well as I hoped. They were not too bad, and I still ate them, but the recipe definitely needs a bit more tweaking before it’s good enough to post. This puto lanson, however, came out amazing which is not surprising as they’re so easy to make, they’re hard to mess up. They can’t get any simpler than squeezing the liquid from the grated cassava, stirring it together with brown sugar, and steaming the mixture in tin molds for 20 minutes! Puto lanson or also known as aripahol balinghoy is a type of steamed cake from the Visayas region made with grated cassava and brown sugar. 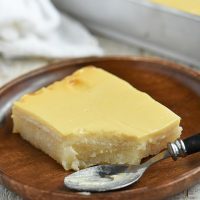 Popular as a mid-afternoon snack treat, cassava puto are often enjoyed warm with grated coconut or margarine and muscovado sugar as a topping. Shredded young coconut can also be added to the cassava mixture. I usually skip it since I like to enjoy the steamed cassava with grated coconut on top. You can add about one cup if you want. I bought my tin molds at SM supermart when I went for a vacation in the Philippines last March. If you can’t find them, you can use empty tuna cans. Make sure to poke a few holes on the bottom of the tin molds to allow the steam to go through, which will help cook the balinghoy evenly and makes for a softer texture. For added aroma, line the sides of the molds with banana leaves. Want a deep caramel flavor? Place a layer of brown sugar in each tin before filling with the cassava mixture. Try not to pack the mixture in the molds too much lest the puto will come out dense. 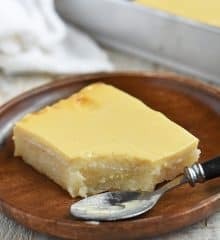 Cassava Cake with Custard Topping-seriously the best cassava cake you’ll ever try! Using a cheesecloth, squeeze the grated cassava to dispel juices until dry. Discard liquid. In a bowl, sift through the cassava using hands to break clumps and remove any hard fibers. Add brown sugar and shredded young coconut, if using. Stir together well combined. Divide cassava mixture into the tin molds. Use a spoon to gently pat and even the surface. Arrange the molds in a single layer on the steamer basket. Over medium heat, bring water to a boil in the steamer pot. Place steamer basket, cover, and steam the cassava puto for about 20 minutes. Remove from heat and allow to slightly cool. Invert the puto to release from molds, brush top with margarine and sprinkle with grated coconut or muscavado sugar if desired. Serve warm. Nutritional info includes the optional young coconut and the toppings. Lalaine, thanks! And thanks for sharing your great posts every week! I need to make this ASAP! Cassava, coconut and sugar? Yum! Salamat, Lalaine! 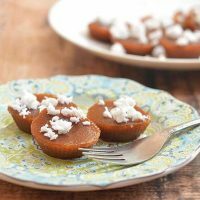 Will ceramic ramekins work with this recipe? I’m eager to try it but I’ll have to eat a lot tuna if I’ll use tuna cans LOL Thanks for your reply. Hahaha, Caroline, you made me laugh so hard this late in the evening I think I woke up the neighbors LOL. Yes, using tuna cans might not be feasible. I saw one video on Youtube where they use tuna cans as puto molds and I thought that was very resourceful. 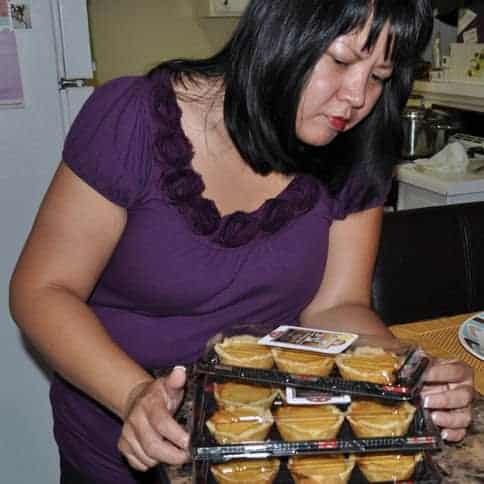 In regards to using ramekins, I haven’t tried them in this recipe but I do use them for making flan or regular puto but I am not sure how they’ll work here as I had to make holes in my tin cans to allow the steam to go through which helps cook the balinghoy evenly and makes it softer. I researched on Youtube to see if the holes are necessary, I saw one video where they used puto molds without holes but they inverted the cassava midway the steaming time to cook it evenly. When the puto looks set on the top, you flip them in the mold so the bottom will steam as well. Hope this helps! Do you ever think about selling the cooking tins? I love your recipes and wish I had the correct bakeware.